Something a little bit different for today’s blog post. 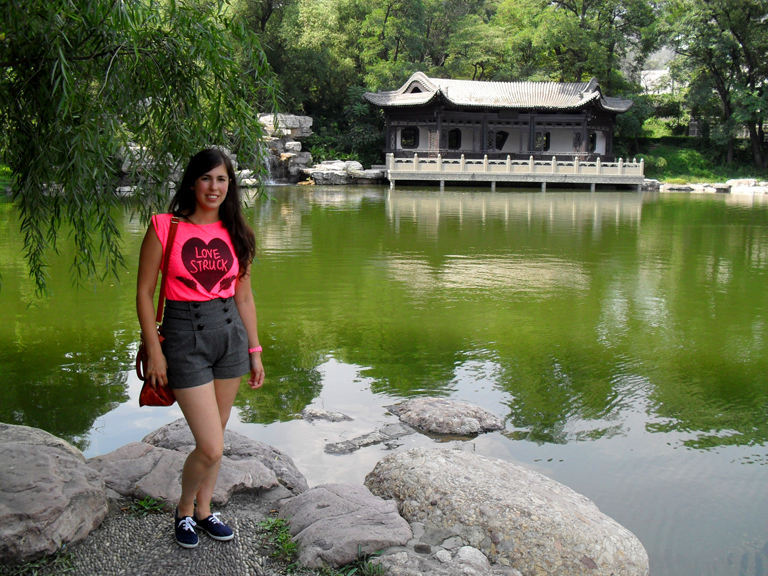 In 2013, I was lucky enough to visit China in 2013 for nearly two week, travelling to Beijing, Tiayuan and Shanghai. It was my first time outside of Europe and was an amazing trip- it was so great to see a culture so different to our own. I drank a lot of green and jasmine tea while we were in China, as I don’t drink alcohol and didn’t want to be constantly drinking fizzy drinks (we were advised to steer clear of drinking water and having ice in our drinks). 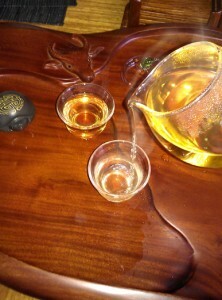 I was never too fussed about any tea other than an English black tea with milk, but I discovered a great liking for Chinese teas as well as finding out that there were many, many more than the few I was familiar with. I now tend to drink Chinese and Japanese teas with most oriental meals. Whilst there I discovered just how seriously the Chinese take their tea. A supermarket in Taiyuan near to where we stayed had a whole shop dedicated to tea, where we were asked to sit down and try the teas before we bought. 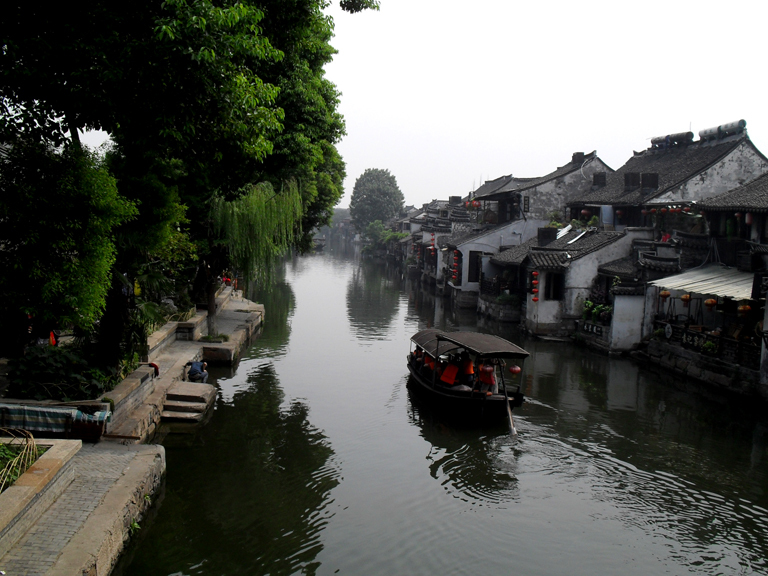 Near the end of our trip we visited Shanghai and spent a day at Xitang ancient water town, an entire town built on water, a bit like Venice. Here we visited a very traditional tea house for tea in the afternoon and sat in a little garden around tea making equipment, overlooking the waterways, watching the boats going by. I became fascinated by the whole ceremony around tea drinking. We were sat in front of what looked like a large carved stone slab (a Chinese tea table), with a tiny teapot, a glass jug, tiny little cups (we had come to realise that tea is generally drunk from little cups rather than larger cups or mugs- but this really makes you appreciate the flavour of the tea more), a pair of wooden tongs and a couple of funny little pottery statues, which I was to discover were ‘tea pets’. 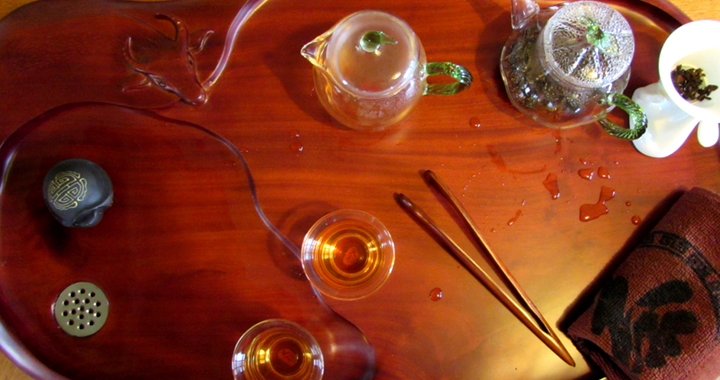 The whole afternoon was a fantastic introduction to the Chinese tea ceremony and the processes that they go through for the perfect cup of tea. When I got back home I decided I wanted to be able to recreate this ceremony at home and set about buying all the equipment I would need for this. I already had several sorts of tea that I had tried and bought in China. Now, if we have guests for an oriental meal (in Japan they also have tea ceremony, but it is apparently a lot more elaborate), I can set up the tea ceremony and recreate it like we had in China. Not everyone I show it to appreciates the ceremony (in fact my sister thought the whole process was long drawn out and pointless) and I suppose having the experience of it in China has created a lasting place for it in my heart. There are certain essential items needed for the tea ceremony. Let’s start with the basics. A teapot, a jug and cups. 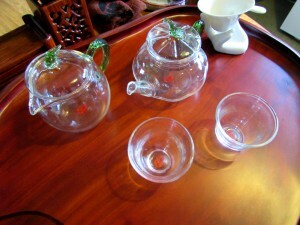 I bought a complete glass teapot in the tea shop in China I mentioned above. I hadn’t even planned to buy a tea set in China but when we were shopping with my brother and sister in law for a tea set for them and the shopkeeper brought out this set with the little pumpkin shaped teapot, I had to have it. Disappointingly the cups of this set are completely plain so I am going to get some more decorative ones at some point. 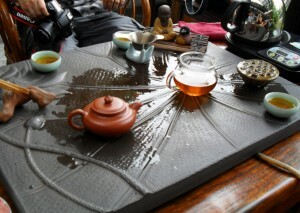 Then there is the tea table itself. 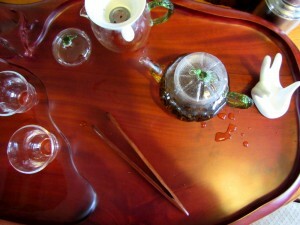 Chinese tea tables come in many different sizes and forms. I have a small bamboo box table which I use for everyday tea drinking and then a larger oval wooden ox head tea table, which has two levels across it and a drain for the discarded water and tea to drain down. A larger table is really needed for the full tea ceremony as you end up with quite a lot of equipment laid out. My table came from China but I actually bought it on eBay from someone who had brought it back from China and never got round to using it. 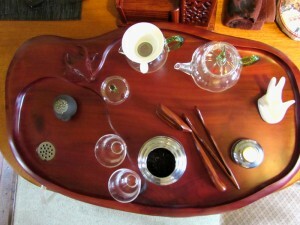 Finally there are wooden tongs for picking up hot cups, a scoop for the tea, wooden coaster for holding the cup (all these part of a cha dao tea utensil set), a strainer and holder and a tea pet. 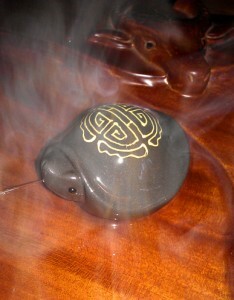 The latter is a little animal or figure that sits on the table and has the tea offered over it, for good luck. My cha dao set (which I haven’t taken a proper picture of, but you can see behind the tea table in most of my pictures) came from the same seller as the table on eBay and came with scoop, tongs, tea pick (for solid teas) and pusher, as well as wooden tea coasters for holding your hot tea cup in a decorative holder. 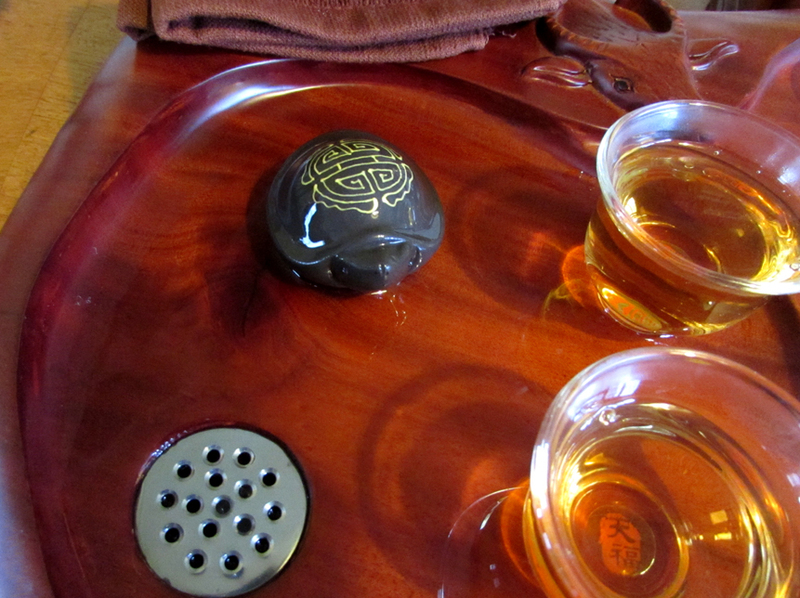 My strainer has a porcelain hand shaped holder (like the one used in the tea house in Xitang- see picture above). Tea pets come in hundreds of designs and shapes and made of different materials. I have a yixing longevity turtle tea pet. You can have two or three on a tea table if desired. I bought both of these from eBay, from sellers in China. I am not Chinese and have only seen the ceremony performed for me once, so I may not be giving a completely accurate description of it, but this is my understanding and interpretation of it. Once everything is set up and tea has been added to the teapot, hot water is poured from a kettle or larger teapot (I used my cast iron teapot for this as a kettle a bit of overkill for such a tiny teapot). 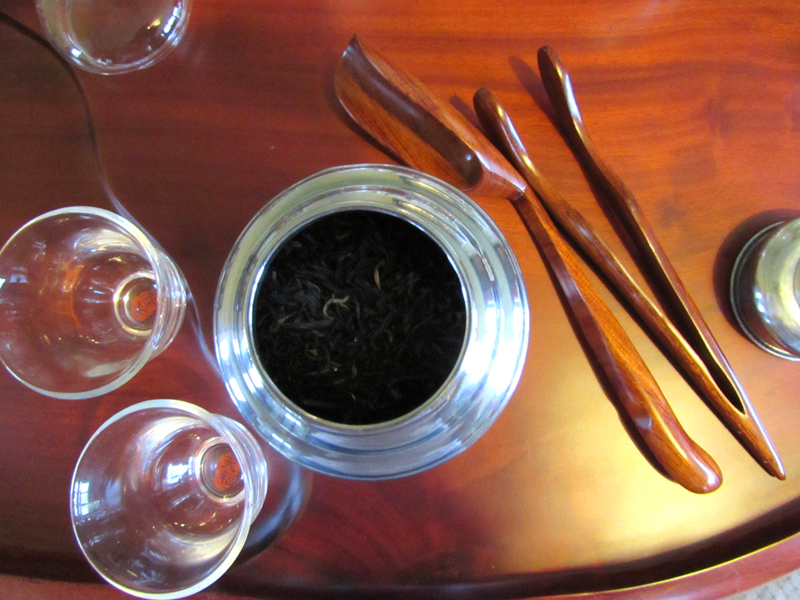 I used Osmanthus black tea from Imperial Teas. I used about a scoop of the tea using the scoop from my cha dao utensil set. 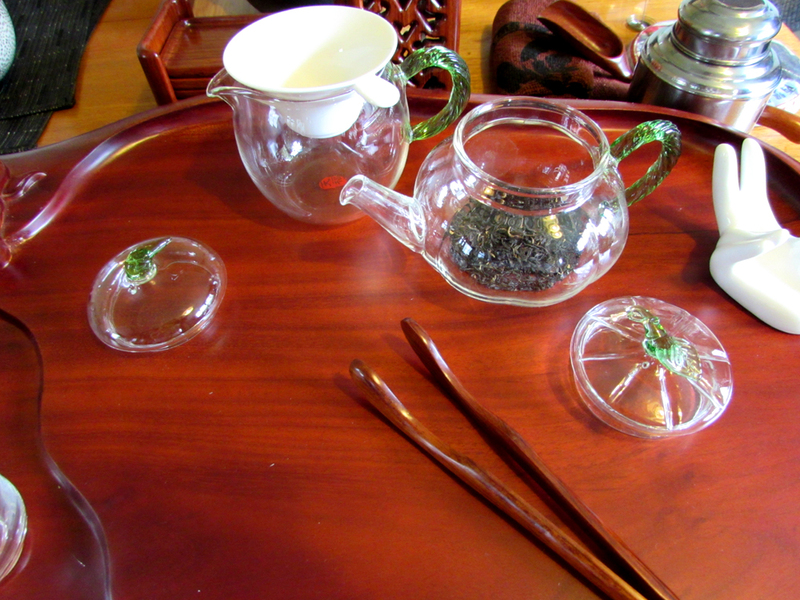 The first teapot is purely for warming everything up and cleaning the tea leaves, so this is poured into the tea jug with a strainer over for catching the leaves and then this is poured into the teacups. The teacups are then emptied using the tongs down the drain. 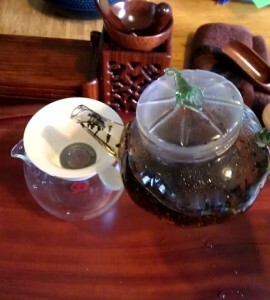 Any leftover tea in the jug I pour over the longevity turtle for luck. Now the tea leaves have been cleaned and all the equipment is warm, I start again with the hot water in the teapot, which after a few minutes steeping time is transferred to the jug. The trick with this is pouring from as high as possible, as this adds air to the water making a better tasting tea. Once the jug is full, the strainer is placed on its holder and the tea is then poured into the cups. 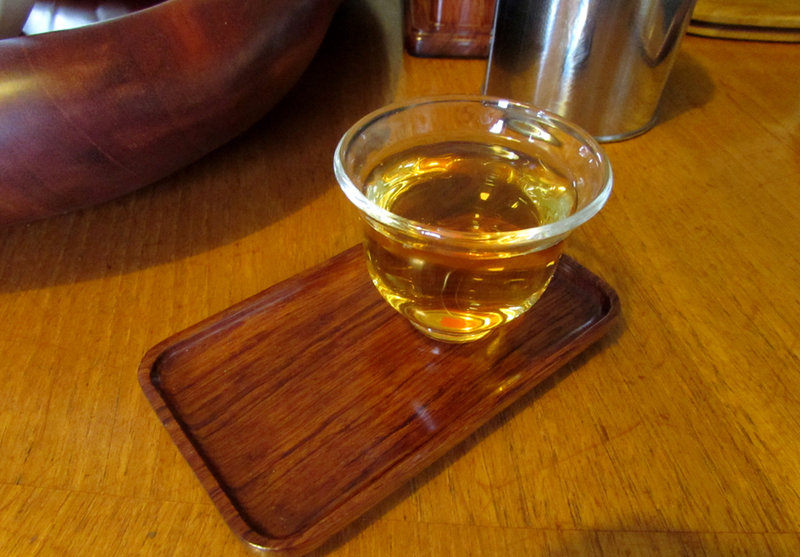 This is the first cup of tea that can be drunk. Each time the teapot is refilled, the tea has a slightly purer flavour, so it probably not until about cup three or four that you are tasting the tea at its best. One final fun thing is my longevity turtle. There are some tea pets that have an extra feature of squirting out water. When we were in Xitang, some of the shops sold these, especially the famous ‘pee pee boy’ ones and because of a language barrier I thought they were just odd ornaments. I now realise that if you submerge these tea pets in a bowl of cold water and then pour the hot tea over, they squirt water. It feels like they are giving you a little something back for the tea you have offered them. In the case of the longevity turtle, it squirts water from its mouth. Posted in Guides and tagged Guides, Tea.